The above photograph is nearly fifty years old and I doubt that very many people recognize it—or for that matter have ever seen it before it was recently included in a slide show at The Big Picture—or can identify the event that it depicts and marks. I couldn’t. But it is nevertheless interesting for several reasons. For one thing it is a reminder of how homogenous the press corp was as recently as the mid-1960s. The site for this image is the Treaty Room in the White House and so it is possible that Helen Thomas can be found somewhere in the vicinity, but she certainly isn’t in this photograph which is not only lily white, but masculine to the core. For another thing, notice the flood lights that are illuminating the table and document being photographed, a reminder that image events and photo-ops have long been part of the political process. But what is perhaps most interesting is that apart from the journalists, there are no obvious political agents of action here. If we can assume that event marks the signing of a treaty, there is no direct evidence of who might have engineered or negotiated it and no evidence of who might take credit for it. The painting of presidents looking down upon the scene would seem to suggest that whatever victory is to be claimed here inheres in the presidency as a democratic institution and not an individual president. It is hard to imagine such a photograph being taken today. 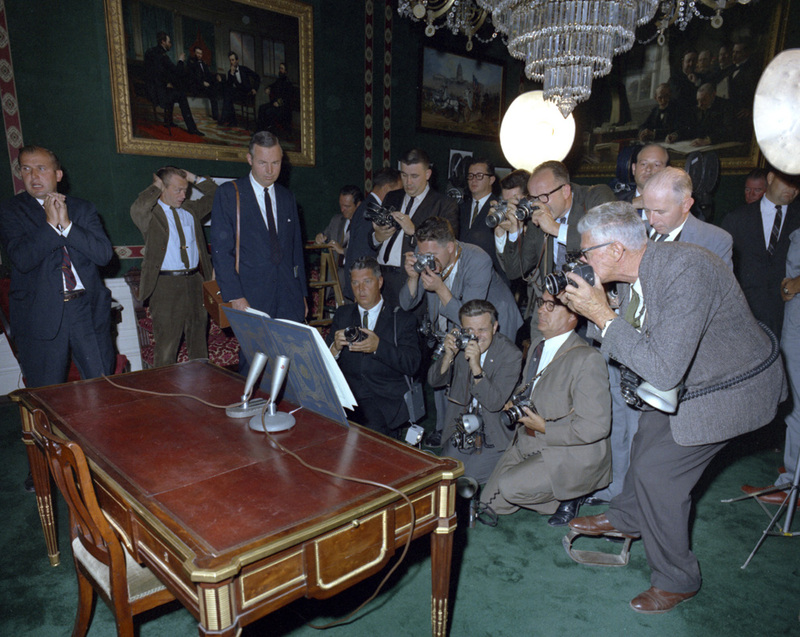 If you haven’t figured it out by now, the photographers are huddled around the Nuclear Test Ban Treaty, which was signed by then President Kennedy on October 7, 1963. It was an incredibly important historical event given that concerns about above ground nuclear testing had been on the international public agenda since the middle of the Eisenhower administration in 1955. But no less important are contemporary efforts to manage nuclear arms through the Strategic Arms Reduction Treaty (START), a treaty that as recently as September 16, 2010 was endorsed by four republican members of the Senate Foreign Relations Committee, as well as a number of Republican stalwarts of national security, including Henry Kissinger, James Baker, and George Schultz. Even Patrick Buchanan notes that the Presidents he worked for—Nixon and Reagan—would have supported it. As of this morning, however, it appears that only one Republican Senator—Richard Lugar of Indiana—supports the treaty, while congressional Republican leadership in general seems determined to deny any and all initiatives by the Obama administration, notwithstanding any value they might have for something like national security or the possibility of movement towards a nuclear free world. Of course it is possible that Republican senators such as Christopher Bond of Missouri have good reasons to be skeptical of the verification standards built into the New Start treaty, and one can only hope that he will reveal the “secret” information he claims to have that supports his worries. Or perhaps John Kyl of Arizona is correct to try to “negotiate” for additional support to the $84 billion dollars already dedicated to “nuclear modernization” in return for his support, though its not clear how much would be enough to meet his concerns.